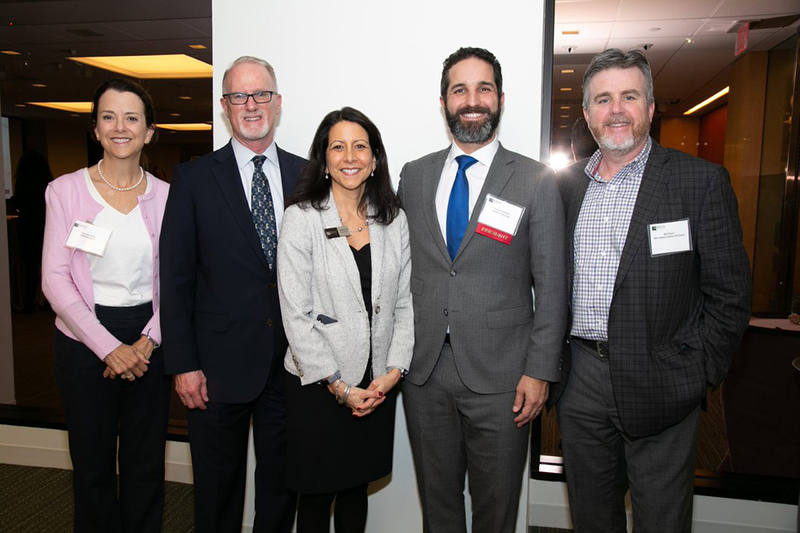 Boston, MA On Thursday, January 24th, over 100 members gathered for the Greater Boston Real Estate Board’s (GBREB) installation of officers, where Travis D’Amato, SVP and managing director, Walker & Dunlop, was sworn in to his role as 2019 REFA president. Erika Clarke, vice president- commercial property management, National Development and 2019 GBREB chair took the oath of office and presided over the meeting, swearing in five division presidents and three officers, including Andy Rosen, senior vice president – commercial real estate banking, Bank of America Merrill Lynch, 2015 REFA president. On Wednesday, January 16th, over 150 members and guests attended the Annual Forecasting Luncheon which was held at WilmerHale. The program included industry leaders, including keynote speaker Dr. Mary Burke, senior economist, Federal Reserve Bank of Boston; moderator Travis D’Amato, and speakers Pam Herbst, managing director, AEW Capital Management; Gary Magnuson, head of commercial real estate, Citizens Bank; and Eric Schlager, CEO, The Bulfinch Cos.
On Thursday, February 28th REFA will be hosting a program on “CRE Tech in Practice.” The program will be moderated by Bill Nowacki, managing director - decision science, KPMG. Panelists include: Maureen Joyce, director, AEW Capital Management; Hisham Kader, EVP and CFO, GID Investment Advisers LLC; and Jim Whalen, SVP, chief information & technology officer, Boston Properties. The program will be held at Morgan Lewis, One Federal St., from 7:45 – 9:15 a.m.
On Wednesday, March 20th, REFA will host a fundamentals on “Loan Documents.” Wendy Fiscus, partner, Nutter and Mandy Eckhoff, partner, Robinson + Cole LLP will be co-hosting this program to provide participants with the basic fundamentals and key elements of loan documents. • REFA Charitable Golf & Tennis Tournament: Monday, July 22nd at Dedham Polo and Country Club. • 31st Annual REFA Gala: Thursday, October 17th at the Westin Copley Place.